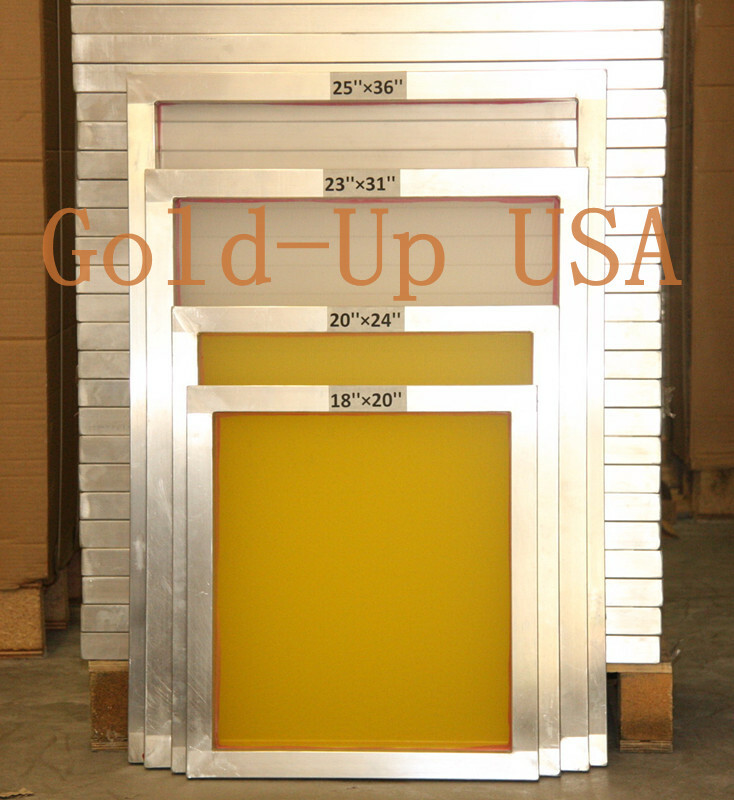 6 Pack Aluminum screen printing screens AL18"x20"
Mesh count 90,110, 130, and 160 could be mixed into the 6 pack. For example: You order the 6 pack of 110 mesh and write a note (2-110 mesh, 2-130 mesh, and 2-160 mesh) on the Order Instructions/Comments from the order procedure Step 4. Any mesh count higher than 160 mesh or lower than 60 mesh is not applicable. This special 6 pack promotion is for online customers only. It's not applicable to order in store or order by phone. Great general use everyday frame, I like the glue past the edge of the frame into the unprintable area of the mesh, it helps resist the pealing of the mesh away that is more common with wooden frames. mesh quality is " OK". As a small shop this is my workhorse frames and price is allowing me to change over my older warped wooden frames. I would like to see a 18 pack in all the frame sizes. These are the second batch of screens I have ordered, first ones were from another company on the web. Both are aluminum and both are built solid. What I really love about these over the first set is that Gold-Up uses a red glue for the bonding along the sides, which makes the taping between the glue and emulsion very easy. I also really like the tags they put on to show what size mesh each screen is. I will buy all my future screens from Gold-Up. Have been using Gold up for the past few years won't buy my screens anywhere else! great durability !! Just received my third half dozen of these and will continue.Why wouldn't I...they are perfect and ship faster than lightning. This is the second batch of screens I have bought.Sweet. Not to mention the fast as hell shipping.I will be ordering more I'm sure. I have been using this product for over a year, and the quality is excellent, mesh is durable, frames are square and tension is good. I ordered 6 frames as a test of this product, at first glance i like the finish of the aluminum smooth no rough edges or points. The glue finish is the entire width of the alum and into the edge of the unprintable part or the mesh which I feel give it a better hold and less chance of the mesh getting lifted off of the frame during coating and printing and reclaiming. No defects were found in the mesh its self. We will start testing the mesh and durability, if they pass then we will start ordering replacements for our aging wood frames. Click the button below to add the 6 Pack Aluminum screen printing screens AL18"x20" to your wish list.